If you are planning on leasing a commercial truck and have some questions, don’t worry, you are not alone and you are likely not the first. Investing in a commercial truck is a big endeavour, involving a considerable amount of money and risk and you want to be sure that you have all of the necessary information going into it. 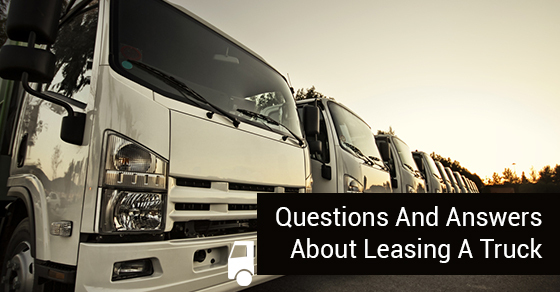 Below are four of the most common questions that first time leasers have about truck and trailer and commercial truck leasing. What is a full-service lease? Some financing companies will offer you additional fleet management services and options that can then be rolled into your monthly payment on your lease. A number of items, such as brakes, glass, tires etc., are usually only given to you once during the life of your vehicle. Whenever something needs to be replaced, it’s on you. A full-service lease will typically cover the cost of repair or replacement for these items up to a specified number of kilometres, after which you will become fully responsible. If you choose to go with a full-service lease, the cost of these items will be priced into the lease, making it more expensive, but, depending on the stress you think those components will be under, could end up saving you money in the long run. Leasing often makes financial sense when owners want the flexibility to list the vehicle as an on-book, or off-book asset, depending on what the accounting looks like. A loan is treated as strictly on-book when the value of the vehicle goes in the “asset” column of the balance sheet, and the loan value in the liability column. The reason that it matters whether or not you list the vehicle as an off-book, or on-book asset is because it ends up having an impact on the company’s debt-equity ratio when you go to apply for additional business loans and/or other forms of financing. When you list an asset as off-the-book, the lease does not show up in the company’s liability column on the balance sheet, giving you a healthier debt-to-equity ratio. Can I get out of my lease if I start losing money? The terms of your commercial trucking leasing agreement will dictate how flexible your contract is, for instance, whether there are penalties for trying to void the contract before a certain period is up, etc. Typically the more flexible the contract is, the more money that the company providing the financing is going to want in the form of monthly payments so it can be sure it is getting its money back. Truck and trailer leasing has allowed innumerable truck and trailer operators to start a business and make money, but there are some questions to keep in mind before making the decision to lease. Keep the above three questions in mind and enter into negotiations with all of the necessary information.